Hiking Map for The Martian? Play our genuinely fun game to explore Mars with a more basic map. Educators, scroll down for a quick list of key resources in our Teachers’ Toolkit, including a map of Mars—and a map of The Martian. Click to enlarge! This spectacular map of Mars covers about 10 million square kilometers (3.8 million square miles), or about 7% of the Martian surface. Zoom in for an even bigger version here. The new map of Mars was created by the British Ordnance Survey. What does the Ordnance Survey normally do? There’s a nice inset map that indicates the map’s cardinal directions and place on the planet. Grid: horizontal and vertical lines that intersect and are used to locate objects in relation to one another on a map. The map’s grid is in blue. Here, the legend is called Communications, General Information, and Technical Information. Sources are nicely listed in the second column of “Customer Information”: NASA/Jet Propulsion Lab/Goddard Space Flight Center, the USGS, astrophysicists Brian M. Hynek and Gaetano Di Achille, and planetary scientist Peter Grindrod. What does the map’s coloration indicate? Colors correspond to different elevations on Mars. The greenish color indicates low valleys or gorges, and the purple color indicates high peaks or ridges. The cartographers let us know that the shading is exaggerated between 5 to 50 times. Zoom in. What do the lines and circles on the map indicate? The circles are topographic or contour lines. These lines connect points of equal elevation. Use this activity to make a contour map of your own. What are the red-colored points on the map? The red colors indicate the landing sites of Mars Pathfinder and the MER (Mars Exploration Rover) Opportunity. Pathfinder landed on Mars in 1997 with two parts: a lander (later renamed the Carl Sagan Memorial Station) and a robotic rover named Sojourner. Sojourner explored Mars for about three months, and the lander was used by space pirate Mark Watney to contact Earth. Opportunity landed on Mars in 2004, and is still an active explorer. What are the large-type names on the map, such as Arabia Terra, Ares Vallis, or Acidalia Planitia? These are simply big landscape features or general regions on Mars. Arabia Terra is the big region that describes most of the map. Ares Vallis is an outflow channel, or valley carved by fluids (probably water) millions of years ago. Acidalia Planitia is a relatively flat plain. What are the small-type names on the map, such as Schiaparelli or Becquerel? These are smaller features—mostly craters left by meteor impacts. Schiaparelli is a great big crater, Becquerel is a slightly smaller one. 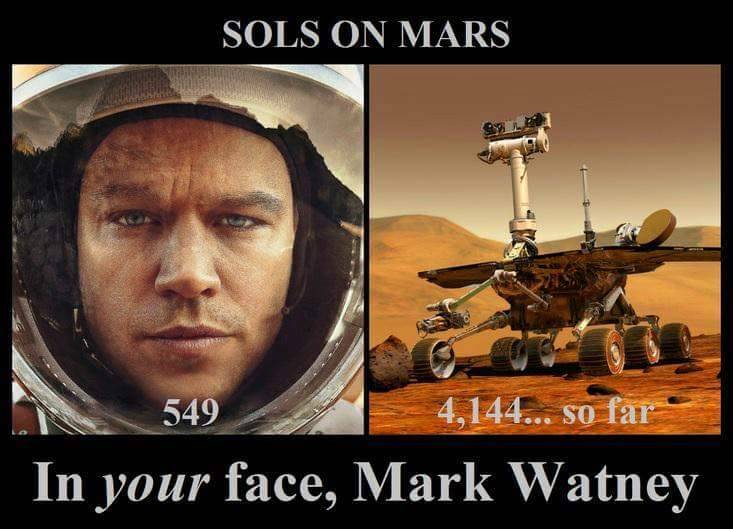 Here’s your pop-culture payoff: Mark Watney, the protagonist of Andy Weir’s novel The Martian (played by Matt Damon, of course, in the Oscar-nominated movie) visited all these places. 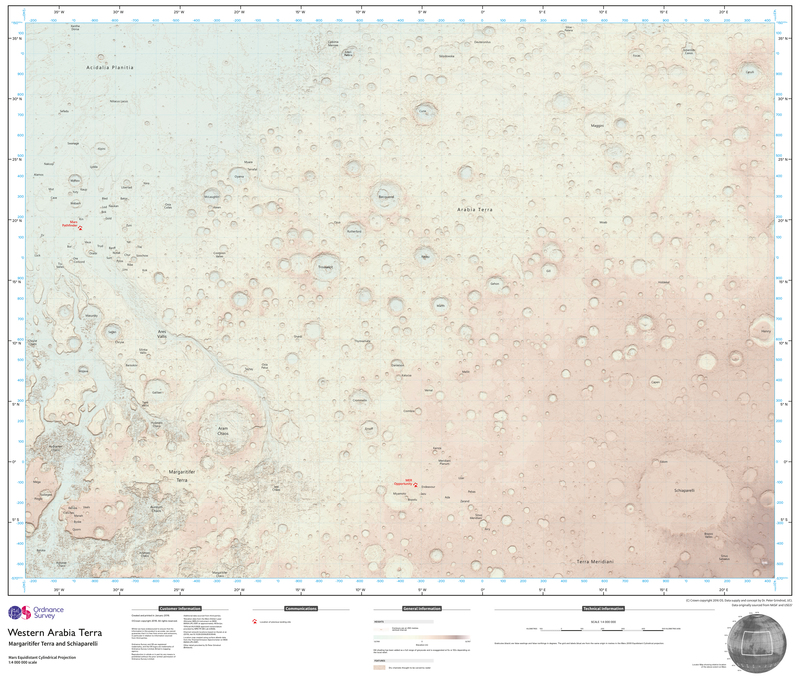 Use NASA’s Mars Trek, this fantastic fan-map and the Ordnance Survey map to chart Watney’s course—or your own. Watch out for those dust storms.